The UK’s first floating solar farm was just installed in Berkshire. The floating array features 800 photovoltaic panels and has a capacity of 200kW. The project cost £250,000 ($405,400) and has been installed on a reservoir at Sheeplands Farm near Wargrave. Farm owner, Mark Bennett, has partnered with floating solar pioneers Ciel et Terre, and hopes to spur interest in applying the technology on reservoirs throughout the UK. Floating solar has garnered so much interest because it offers a way to generate solar power without tying up large tracts of land. Arrays can be built on water courses such as reservoirs, quarry lakes, irrigation canals, or remediation and tailing ponds that are generally not used for any other purpose. These installations ad value to the waterways, especially when usable land is scarce. The solar panels also serve to shade the water, reducing evaporation. Similar systems have been trialed in France and India, and Japan intends to install the world’s largest floating solar array (with a massive 1.7MW output) near Osaka. The Japanese array will be part of a larger 60MW project developed in partnership by Ciel et Terre, Japanese solar giant Kyocera and the Century Tokyo Leasing Company. Back in the UK, Bennett’s solar farm uses Ciel et Terre’s modular Hydrelio system. He says the potential is there for systems to be up to 100 times the size of his installation. “We are speaking to big utility companies, to agricultural companies – anyone with an unused body of water. The potential is remarkable,” he told NCE. The floating solar panels are made of 100 percent recyclable materials, have a life expectancy of 30 years, and are safe to install on drinking water reservoirs. The Berkshire farm is expected to provide a return on investment in six years. Bennett will earn around £20,500 ($32,000) a year for the next 20 years from consumer-funded subsidies for the power generated, and he will save around £24,000 ($38,900) a year on his farm’s power bills. Mr Bennett has formed a new company, Floating Solar UK, to promote and distribute the technology. "The floating array features 800 photovoltaic panels and has a capacity of 200W." Is it 200W or 200kW? The UK’s first floating solar farm has just been installed in Berkshire. 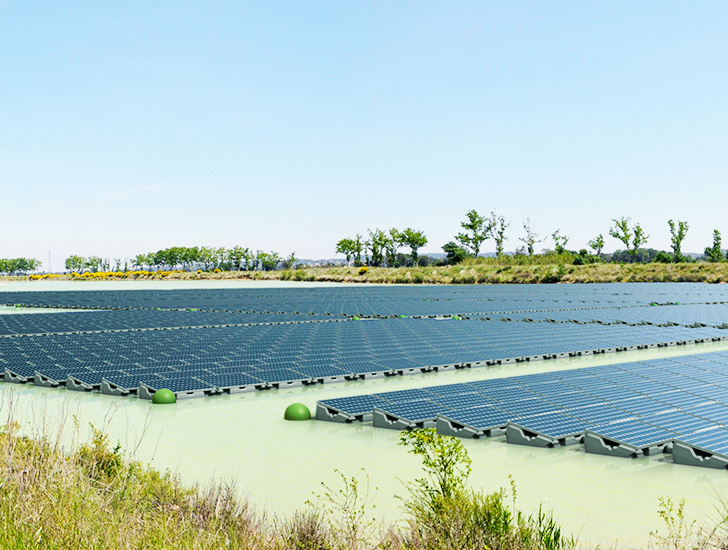 The floating array features 800 photovoltaic panels and has a capacity of 200W. The project cost £250,000 ($405,400) and has been installed on a reservoir at Sheeplands Farm near Wargrave. Farm owner, Mark Bennett, has partnered with floating solar pioneers Ciel et Terre, and hopes to spur interest in applying the technology on reservoirs throughout the UK. Floating solar has garnered so much interest because it is a way to generate solar power without tying up large tracts of land. It targets water courses such as reservoirs, quarry lakes, irrigation canals, or remediation and tailing ponds that are generally not used for any other purpose. It value-adds to them, especially when usable land is scarce. The solar panels also serve to shade the water, reducing evaporation. Similar systems have been trialed in France and India and Japan intends to install the world’s largest floating solar array near Osaka with a massive 1.7MW output, again through a partnership with Ciel et Terre, as well as Japanese solar giant Kyocera and Century Tokyo Leasing Company.